When I reviewed the initial release of Numbers for iPad in April 2010, I noted that it worked well for creating original spreadsheets, and for working on Numbers-native spreadsheets from your Mac, but that it fell short due to its inability to output files in Excel format. (Though Apple’s app could read such files, it would convert them to Numbers format). That version of Numbers was also available strictly for the iPad, and not the iPhone or iPod touch. Numbers 1.4 addresses the Excel issue, adds some other welcome features, and can now be used on the iPhone (3GS and 4) and iPod touch (third- and fourth-generation) in addition to the iPad. In this review, I’ll focus on what’s new in Numbers, and discuss its use on the smaller iDevices. The big news in this Numbers update is the small news—you can now use Numbers on certain iPods and iPhones. While Numbers is a Universal app (one version for all iOS devices), there are a couple of features in Numbers on the iPad that you won’t get to use in Numbers on the iPhone or iPod touch: full-screen mode and landscape view. On the iPad, you can enter a full-screen mode to get an overview of your data, and run quick summaries of data sets with a simple flick of your finger. You can’t do much more than that, though, so the lack of this feature on the smaller-screened iPhone and iPod touch may not be a major problem for most users. The lack of landscape mode, though, is more troubling—many worksheets are laid out in a landscape orientation, and viewing a super-wide landscape spreadsheet on an iPhone in portrait mode can entail a lot of finger swiping. I didn’t realize just how often I used this mode in Numbers on the iPad until I flipped my iPhone around for the first time, expecting to see my worksheet flip, too. When it didn’t, I thought I had the iPhone’s orientation locked, but that wasn’t the case. There simply isn’t any support for landscape mode on the iPhone and iPod touch. One other minor but potentially annoying “feature” in Numbers on the iPhone and iPod touch is that you can only undo and redo changes by shaking your device—in the iPad app, there’s a dedicated button in the toolbar that doesn’t appear when you run the app on smaller iOS devices. When developing a spreadsheet, I use undo and redo a lot, and shaking the phone—over and over again—to accomplish that task gets old really quickly. I found myself longing for the iPad’s dedicated button after only a couple of undo shakes. While Numbers works just fine on the iPhone 4, my biggest problem with it is that there’s simply not enough screen real estate to work productively. It seemed every time I wanted to do something, I was either scrolling or zooming to make sure I had the right cell selected, or to see the big picture. It’s also very hard to get a sense for how your finished project will look when you’re laying it out one tiny section at a time. In short, while Numbers runs just great on an iPhone or iPod touch, I wouldn’t want to use it for anything beyond simple spreadsheets or minor edits to larger projects. There’s a reason that serious spreadsheet jockeys usually have monstrous monitors connected to their desktop machines—there’s no such thing as too much screen space when creating large spreadsheet models. This release of Numbers includes a number of new and/or improved features that make it easier to do what you need to do, and to share what you’ve done with others. The big news for me was that Numbers can now export in Excel format; previously, it could read, but not write, Excel files. This means you can now work on an Excel file on your iDevice, and output it back to that same format, so you can share it with those who use Office instead of Numbers. 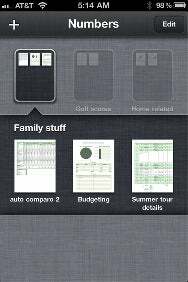 Folded Up: Folders work just as they do in iOS, and bring organization to larger collections of Numbers spreadsheets. You can now create folders in the spreadsheet browser mode. Folders work here exactly as they do in iOS in general—just drag-and-hover one icon over another, and you’ll create a folder. For those with a lot of spreadsheets, this is a welcome addition. Also new since Macworld’s last review is printing via AirPrint printers, though I was unable to test this feature. Not all is perfect in Numbers-land, however. Numbers still can’t import hide rows/columns or merge cells, which are two features that many spreadsheets use extensively. In particular, not being able to merge cells (and having merged cells break on import) will cause some layout headaches. You’re also still limited to your iDevice’s relatively meager font collection, and headers/footers and certain features on graphs also won’t survive the transition from the desktop to your iDevice. Working with files is still more painful than it should be: you’re generally restricted to working with one file at a time (i.e. when copying to/from iTunes), and you can’t open more than one spreadsheet at a time. Later this year, Numbers (as well as Keynote and Pages) will support Apple’s iCloud service. This should greatly ease the sometimes-tricky document management issues related to working with one file on multiple devices. Instead of winding up with multiple copies of the same file on multiple devices, iCloud integration will allow you to have one copy of the file that’s simply synced to all your devices. Create a spreadsheet on your Mac, close it, and you will then be able to pick up your phone and continue working, right where you left off. While iCloud integration looks like a win, it’s not clear yet what will happen with iWork.com, Apple’s perpetually-in-beta iWork document sharing service. The features provided by iWork.com aren’t necessarily replicated by iCloud, so I would expect that it will continue to exist, at least in some form. The potential upside of iCloud support in Numbers is huge, but we’ll have to wait until later this fall to see exactly how well it works, and what becomes of the iWork.com beta program. 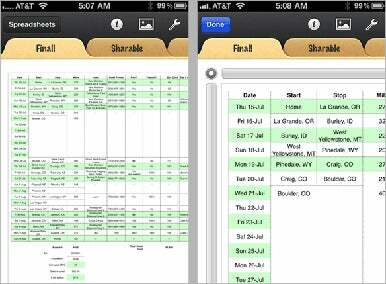 Numbers is a solid spreadsheet program for the iPad and iPhone/iPod touch. Depending on the complexity of your spreadsheet needs, the iPhone/iPod touch support may be a key feature to you, or may just be something that’s good to know if you ever have a critical need to edit a worksheet and you’re not carrying your iPad. But the other features in Numbers make the program worth consideration for working with spreadsheets on the go.